Semi-Gloss: Similar to photographic paper, it is high quality and displays photos and graphics extremely well. This is the most commonly ordered paper for research posters. Maximum printable poster size is 44inches by 88 inches. Matte: A nice paper that is less expensive. 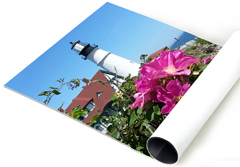 We don’t recommend printing matte posters larger than 36”x48” since the paper is not as durable as our semi-gloss. Perfect for ease of transport! It is wrinkle resistant, fade resistant, tear resistant and folds up and packs easily into your luggage. Use an iron on the back for touch-ups if desired,but probably not needed. Fabric posters are becoming more and more popular. Maximum size is 44 inches by 88 inches. (Colors can be a little less vibrant than paper, but print quality is good).